Scrub and rinse the clams under cool running water. Heat the olive oil in a large soup pot over a medium heat. Add the garlic and sauté over medium heat until soft, but not browned. Add the tomatoes and wine and cook on medium-low for about 10 minutes. Toss in the clams and salt; cover, and cook over medium-high heat for 10-15 minutes. All the clams should be open after this cooking period. If any remain closed, throw them away. Add the parsley, stir, and serve. Serve with toasted bread drizzled with white truffle oil. 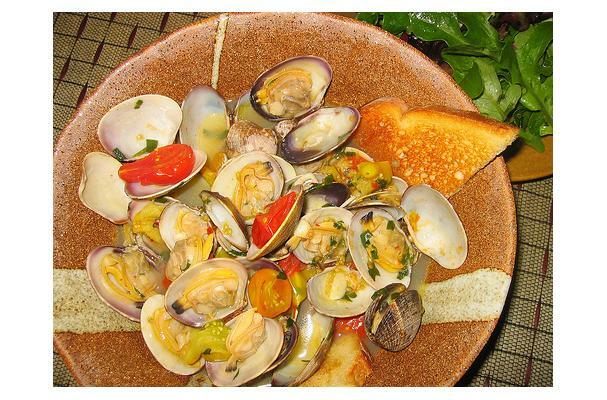 A traditional Italian clam soup. How you choose to prepare the garlic will determine how much garlic flavor you end up with...the more "processed" it is, the more garlic flavor you'll end up with.